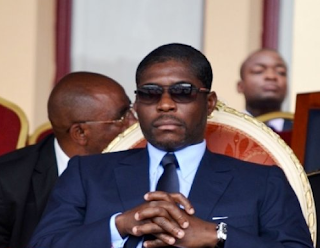 Equatorial Guinea’s Second Vice President and Head of Defense and State Security, Teodoro Nguema Obiang Mangue, was recently promoted to the rank of colonel of the army of the Republic of Equatorial Guinea. As vice president, Obiang Mangue already exercises oversight and policy guidance over the nation’s armed forces. He will continue to lead the ministry of defense, which encompasses the country’s ground, air and naval forces, and the ministry of national security, which encompasses police forces and control of immigration and borders. During his vice-presidency, Teodoro Nguema Obiang Mangue has called for increased pay and improved living conditions for the military to go hand in hand with greater professionalism and improved capabilities. He has also called for a reduction in the number of immigrant workers in order to provide more employment opportunities for citizens of Equatorial Guinea. Prior to his vice-presidency, Obiang Mangue served as minister of agriculture and forestry. Equatorial Guinea enjoys development and democracy, and has become an example of social stability for African countries, said Jeronimo Osa Osa Ecoro, Secretary General of the ruling Democratic Party of Equatorial Guinea (PDGE), in a recent statement. Osa Osa made the statement in response to remarks by President Barak Obama at a meeting of the African Union in Addis Ababa, Ethiopia. President Obama had cited the long tenures of some African presidents as hindrances to the development of democracy in Africa. Osa Osa recalled that African countries are very young democracies, currently undergoing development, and need their own time to evolve. He said, “In these 36 years, the people of Equatorial Guinea have gone from being miserable and anonymous Africans, to being able to exercise a sense of pride and dignity that President Obama spoke of in his speech to the African Union.